Large Span or Portal conservatories are unique and impressive structures made possible by Bahama's technical expertise and years of experience in this specialist field. Large or portal conservatories are unique and impressive structures made possible by our technical expertise and years of experience in this specialist field. Large conservatories are built using a supporting skeleton that sits inside the conservatory. This gives the large conservatory structural support and makes it an ideal venue for a hotel dining room or as a cover for a swimming pool or gym. The large conservatory style requires extra support to take the weight of the roof and give extra stability. At Bahama, our dedicated team is always available to provide advice, estimates and technical information about portal conservatories. We will handle the complete management of your large conservatory project, from concept to design, planning and construction, right through to completion. 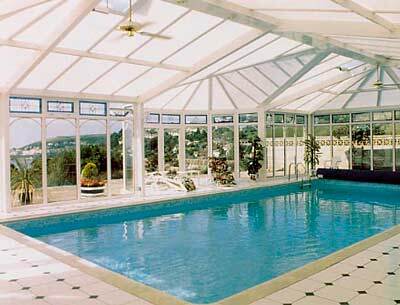 Large conservatory styles are most often used for swimming pools, allowing you to enjoy your pool all year round without worrying about the leaves, insects and weather issues that you get with an outdoor pool. 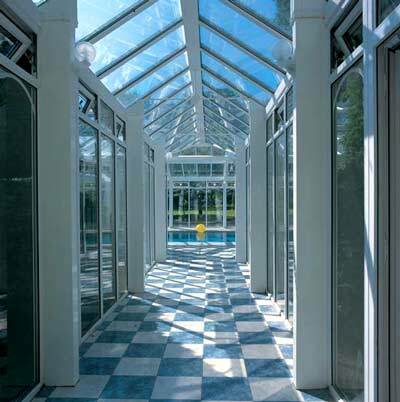 You'll also save money on chemicals and maintenance by housing your pool in a portal conservatory. The large conservatory style is also perfect for a fitness room, jacuzzi or spa. How wide can large conservatories go without sub-structure support? Usually up to around six metres, although we would use tie bars in the roof. If your large conservatory needs a supporting sub-structure, it's usually made from high-grade aluminium or timber and needs to be fixed to the ground. When budgeting for your large conservatory, you should note that this supporting sub-structure must be approved by structural engineers. Large or portal conservatories tend to need planning permission and usually building-regulation approval, too. As a reputable supplier of large conservatory styles, Ultraframe would include planning permission and building-regulation approval in our quote. Some types of large conservatory – certain sliding enclosures and domes – don't need planning permission as they don't fall under the 'permanent structure' category. These large conservatory types are not as imposing as other portal conservatories, but they might fit your budget better. As a rough guide, expect to pay no less than £25,000 for the large conservatory style described here.